Isoroku (Japanese: 聯合艦隊司令長官 山本五十六 – 太平洋戦争70年目の真実-, Hepburn: Rengō Kantai Shirei Chōkan: Yamamoto Isoroku – Taiheiyō Sensō Nanajūnenme no Shinjitsu–, Combined fleet commander Yamamoto Isoroku – Truth of the Pacific War 70 years ago) is a 2011 Japanese war drama film about Isoroku Yamamoto. Other English home media titles of the film are The Admiral, and Admiral Yamamoto. English titles not used in home video releases are Yamamoto Isoroku, the Commander-in-Chief of the Combined Fleet and Admiral Isoroku. The film presents Yamamoto's family life, his attempts to prevent the impending conflict with the United States amid World War II and his run-ins with Japanese war hawks. The Japanese military establishment entangles Yamamoto in the war and orders him to prepare the attack on Pearl Harbor. The making of the film lasted four years. Kōji Yakusho was reportedly the only actor considered for the role of Yamamoto and the film would have been canceled if he turned it down. Yakusho was offered the role in the summer of 2009, and accepted the role in the winter of 2010. The production staff declared it intended to present an image of "what a Japanese leader should be". Rob Schwartz from Metropolis described the film as a "well-paced and well-acted work", which "is not a bad watch for those interested in a Japanese view of the war". Schwartz further noted that unlike the 1968 film with the same title, which "was a piece of propaganda", the 2011 film "doesn’t fall into that trap". Ronnie Scheib from Variety characterised the film as "Izuru Narushima's well-crafted, rather old-fashioned and unquestioning elegy" to Yamamoto, which "succeeds where many biopics fail in fully integrating the private man and the public figure". ^ "Rengô kantai shirei chôkan: Yamamoto Isoroku". Box Office Mojo. 2012. Retrieved 28 March 2013. ^ "Isoroku (Blu-ray)". Blu-ray.com. 2014. Retrieved 15 May 2016. ^ "Japanese minister expresses 'deep emotion' over 70th anniversary of Pearl Harbor attacks". The Telegraph. 8 December 2011. Retrieved 16 May 2016. ^ Schilling, Mark (7 January 2015). "Yamamoto Isoroku (Isoroku)". The Japan Times. Retrieved 16 May 2016. ^ "The Admiral (Blu-ray)". Blu-ray.com. 2012. Retrieved 15 May 2016. 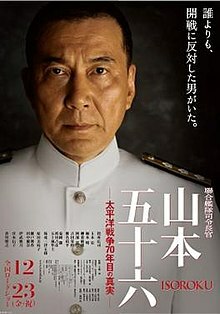 ^ "Admiral Yamamoto (DVD) (Taiwan Version)". YesAsia. 2014. Retrieved 15 May 2016. ^ Elley, Derek (1 March 2012). "Admiral Yamamoto". Film Business Asia. Retrieved 16 May 2016. ^ a b Scheib, Ronnie (11 September 2012). "Review: Admiral Yamamoto". Variety. Retrieved 16 May 2016. ^ Del Bene, Marco (2015). "A Past to be Ashamed Of or Proud Of?". In Kim-fai Tam; Timothy Y. Tsu; Sandra Wilson (eds.). Chinese and Japanese Films on the Second World War. London: Routledge. p. 171. Retrieved 16 May 2016 – via Google Books. ^ a b c Schwartz, Rob (5 January 2012). "Rengo Kantai Shirei Chokan: Yamamoto Isoroku". Metropolis. Retrieved 16 May 2016. ^ a b c "Yakusho Koji portrays WWII naval commander Yamamoto Isoroku". TokyoGraph. 14 May 2011. Retrieved 28 March 2013. This page was last edited on 14 March 2019, at 17:36 (UTC).